"An interesting twist on an age old favorite. Use your favorite shaped pasta - bow ties, shells, penne, etc...Can be assembled ahead of time and refrigerated, but allow extra time for baking." In a medium pot cook pasta in boiling salted water until al dente. Drain well. Cook spinach according to package directions. Meanwhile, brown ground beef, chopped onion, and minced garlic in a large skillet over medium heat. Stir in tomato sauce, tomato paste, and pasta sauce. Simmer for 10 minutes. 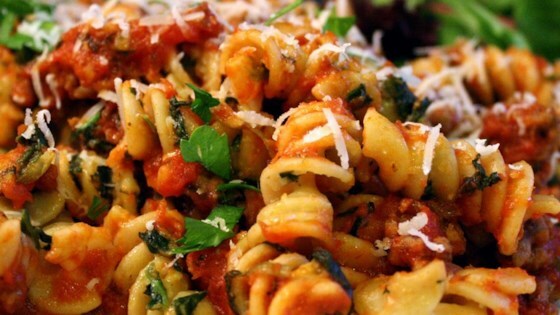 Combine cooked spinach, cooked pasta, bread crumbs, shredded cheese, beaten eggs, and olive oil. Spread spinach mixture evenly into the bottom of a 9x13 inch baking dish. Top with meat mixture. Bake in a preheated 350 degree F oven (175 degree C) for 30 minutes. I thought this sounded like a really great recipe-then I made it for dinner. I ended up not serving it because it tasted so bad. is there any way i could rate it for more than 5 stars? i'm 15, i made this recipe and my family loved it. It's definately a KEEPER!